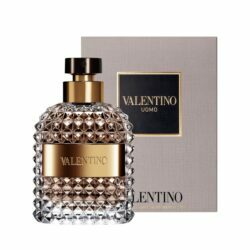 Valentino Uomo Cologne by Valentino, If you’re a man who appreciates woody and nutty accords combined with gourmand notes, valentino uomo should be in your fragrance arsenal. Introduced in 2014 by the valentino scent experts, top notes of bergamot and myrtle mingle with roasted coffee bean and decadent chocolate. Robust leather and cedar form a masculine base that stays with you throughout the day and into the night. Spray on a bit after a workout or before a dinner date with friends.